As part of IEM Miri involvement in local social welfare causes, a small donation was made to the Persatuan Autistic Miri (PAM) during a 1Malaysia Charity Food Fair event. This event was held on 25-27 May 2012 at Permy Mall Miri as a part of the Miri City May Fest celebration. It was also in conjunction with the 30th anniversary of the main organiser of the event, See Hua Daily News Group. PAM hopes that through their participation in this event, they are able to raise fund for their new school building and eventually build a home for the Autistic patients in Miri so that all mature autistic individuals can live in peace and dignity. The small IEM Miri’s donation of RM1000 was used by PAM to buy confectionery, cookies and cooked foods for them to sell during the event. As a symbolic token of support for the event, on 26th May 2012, the vice chairman of the IEM Miri Branch, Ir. Steven Chin, on behalf of the IEM Miri Branch, presented the cheque to the chairman of PAM, Mr. Jerome Chin. Mr. Jerome, on behalf of PAM, expressed their gratitude for the generosity of IEM Miri. 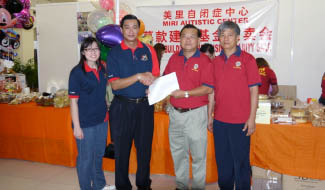 He hopes that more of such corporate bodies would be able to help them to realise their vision for a more caring Miri.